Sony WI-1000X review | What Hi-Fi? 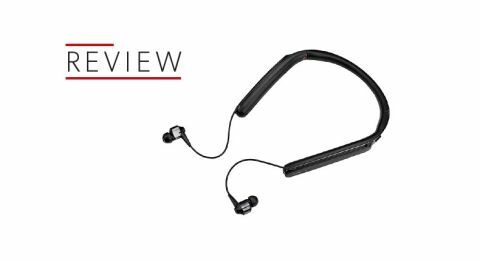 Decent sound and noise-cancelling makes these neckbuds a smart choice. As more phone manufacturers ditch the headphone jack and dongles continue to provide an inelegant solution, wireless listening appears to be the way forward. If this trend continues as we expect, then many smartphone users will shortly need to consider owning a pair of Bluetooth headphones. Those known as ‘neckbuds’ (headphones joined by a collar to keep them together) might be, on paper, best placed to take advantage of this trend. More compact than on-ears, they also tend to have better stability and battery life than in-ear equivalents. Sony’s WI-1000Xs are the bigger siblings of the award-winning WF-1000Xs. For £100 more than the wireless in-ear headphones you get greater battery life, playback control and, most importantly, better sound too. Neckbuds are a divisive design choice. Some people like the collar, others find it uncomfortable. The collar on the WI-1000X feels of a better quality than that on Bose’s QuietComfort 30s - but it’s not as flexible. The buttons needed for pausing music, changing volume, for power on-off and for pairing are all on the band, with longer presses activating playback control. We’d prefer dedicated buttons, but it’s easy enough to use. On the right of the neckband is a button which lets you cycle through the different grades of noise-cancellation. ‘Ambient’ mode lets in surrounding sounds and is consequently useful for running, while ‘Noise Cancelling’ mode eliminates monotonous sounds such as aeroplane engines or air-conditioners, and is more suited to public transport or office environments. If you’re on a flight, try the ‘Atmospheric Pressure Optimizer’ - it adjusts for lower air pressure using a sensor hidden in the neckband. There’s also a degree of customisation available through the Headphones Connect app for Android and iOS. Here you can engage ‘Adaptive Sound Control’ to modulate how much noise-cancelling the headphones do based on your movement (by analysing your smartphone’s location data). We wouldn’t recommend using that setting, though. Even when wearing the Sonys while sitting still in our listening room, the app changed the levels of noise-cancellation - and the adjustment was more distracting than any actual noise. One other important element to the WI-1000X is the addition of aptX HD Bluetooth. This allows you to stream audio via Bluetooth at 24bit/48kHz resolution, as opposed to the regular 16bit/44.1kHz of aptX Bluetooth – provided you have a music source that supports it, of course. Right now, these include certain LG smartphones and some dedicated portable music players like the Astell & Kern Kann. If you’d prefer a wired connection – something usually omitted from in-ear Bluetooth headphones – there’s a 3.5mm-to-micro-USB cable in the box, so you can still listen to your music even if the headphones’ battery dies. Sony claims these headphones will keep going for 10 hours of use with noise-cancellation, and 17 hours without. Pairing the headphones with an iPhone 6S, we load up Deezer and, once we’ve changing the settings in the app to prioritise audio quality, we stream Aaron Burr, Sir from the Hamilton soundtrack. The result is resoundingly pleasant. The light drums and low bass strings running through the song are punchy, clearly capturing Alexander Hamilton’s excitement - but they don’t sacrifice any detail. In fact, each draw of the bow in the song is given due attention by these headphones, revealing a range of textured low frequencies rather than just one block of bass. When the song slows, allowing Burr to give his advice, Hamilton’s immediate reproach and subtle scoff is more nuanced here than through the more affordable Sony’s WF-1000Xs. The sonic character is the same, but there’s more to hear from these neckbuds. Play Farmers Refuted and the organisational ability of the WI-1000Xs keeps each part of Hamilton’s and Samuel Seabury’s verbal debate separate, without losing the call-and-response aspect of the track. The dynamics of the headphones are impressive too. The difference between the conversational interjections and the sudden exclamation that ends the track is a rapid, well-handled change. Push the WI-1000Xs hard and without breaking sweat they still keep enough distance between loud and quiet. We move to a hi-res file of Radiohead’s Burn The Witch on the Astell & Kern Kann, and the headphones hit the high notes of the strings easily and smoothly. The precison with which the cymbals rise into the open soundspace at the start of the track is pleasing. But even if you’re just listening to music videos on YouTube, you’ll be satisfied. Though there’s a distinct drop in quality due to the lower-resolution stream, Nena’s 99 Luftballons is still poppy and relatively detailed. With great sound quality and an array of noise-cancelling features, these Sony headphones are a great step up for those who want in-ear portability with on-ear battery life and power. Though similar to the WF-1000Xs, they have just a bit more juice and musicality. If you don’t care as much about size, and want even better audio fidelity, you should give the WI-1000Xs a try.